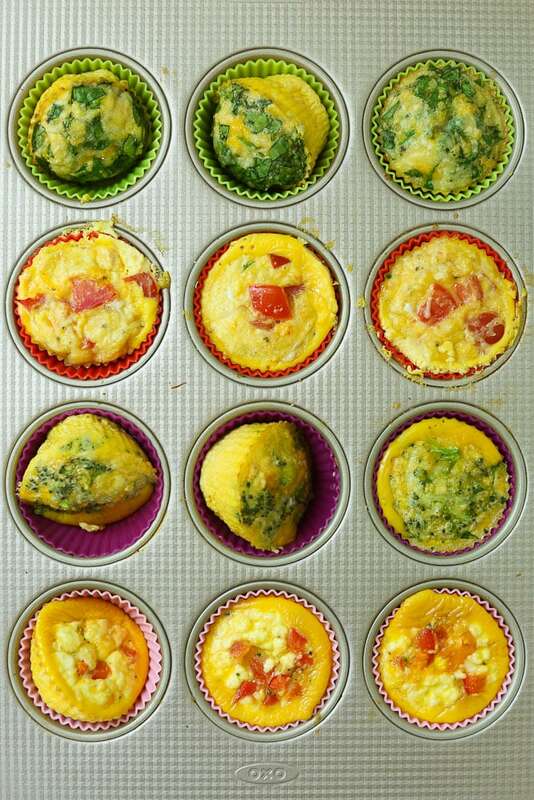 Healthy Egg Muffins make an incredible meal prep breakfast that can be made ahead of time! Here are four different versions–find your favorite! Have you tried egg muffins? They’ve been floating around the Internet for a few years now, and I’ve tried several versions, but haven’t shared any of them here on the blog. 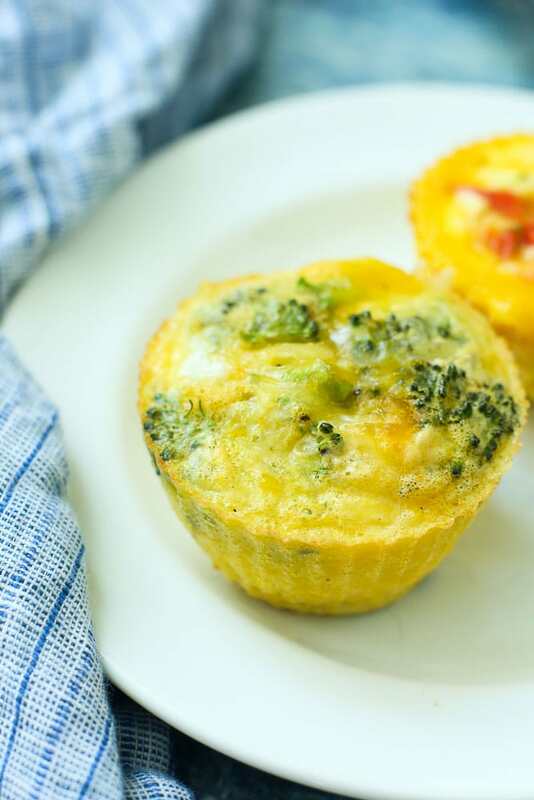 Today I’m sharing my four favorite healthy egg muffins recipes that are perfect for make ahead breakfast! These are super easy to whip up and I can’t think of an easier way to sneak some veggies into your breakfast. Ya’ll know how my ultimate goal is to eat more plants everyday. Broccoli + Cheddar–the classic combination works so well here! Red Bell Peppers + Goat Cheese–this is my favorite. Tomato + Parmesan + Cheddar Cheese–a lovely combination. I put cheese in all of them because I really think these taste so much better with cheese. If you want/need to have them be dairy-free, simply leave the cheese out. I’ve made them without and while I don’t like them as much, they are still good. These really couldn’t be much easier to make. Start with a dozen eggs. Crack ’em in a bowl and then add some salt and pepper. Whisk them together really well. Now you get your add-ins. Add them to a muffin tin. I like to use these silicone muffin cups because I think it’s a safer material than what most muffin tins are made from, and they also make for the easiest clean up. Once you’ve got your add-ins in the cups, you just need to add the eggs. Your muffin cups will be filled to almost the top. Don’t fill them all the way to the top or the egg will spill over. Now you’re ready to put them in the oven. Bake at 350 degrees for 20-25 minutes, until the eggs are set. These little egg muffins are like mini frittatas that happen to be portable and perfect for quick breakfasts! 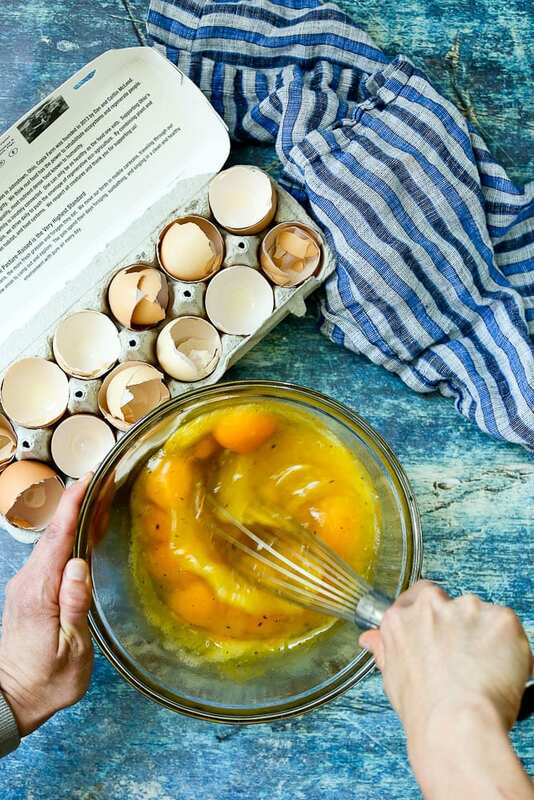 These egg muffins will keep in the refrigerator for 3-4 days, and you can also freeze them for up to 2 months. 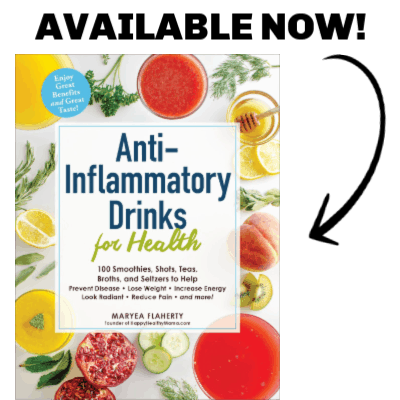 Here’s the printable recipe for you! I hope you love these as much as I do. 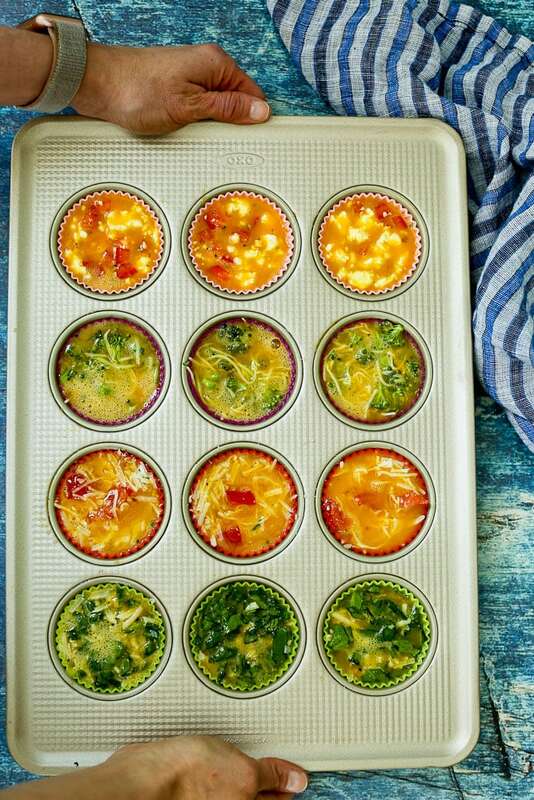 These Healthy Egg Muffins are great for make-ahead breakfasts. There are four variations so you’re getting a good variety of vegetables! Preheat your oven to 350 degrees. 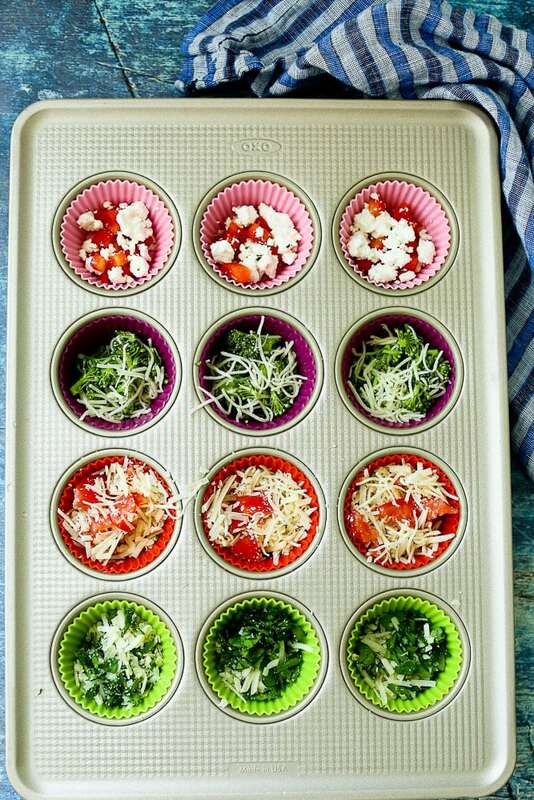 Line a muffin tin with silicone baking cups or oil the baking pan. Set aside. 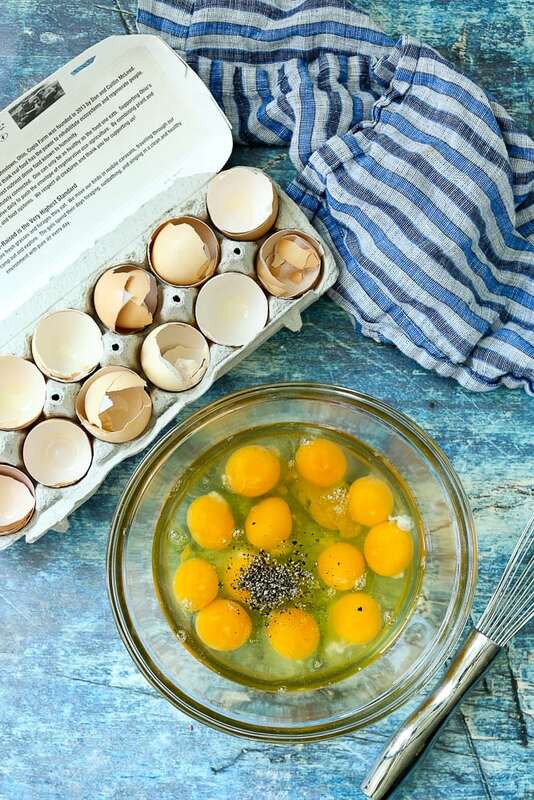 In a medium bowl, whisk together the eggs, salt, and pepper well. Bake in the preheated oven for 20-25 minutes, until the eggs are set. Enjoy! *I chop the vegetables finely so it isn’t necessary to precook them. If you prefer, you can steam them lightly before baking. *The eggs muffins can be stored in the refrigerator in an airtight container for 3-4 days or frozen for up to 2 months. 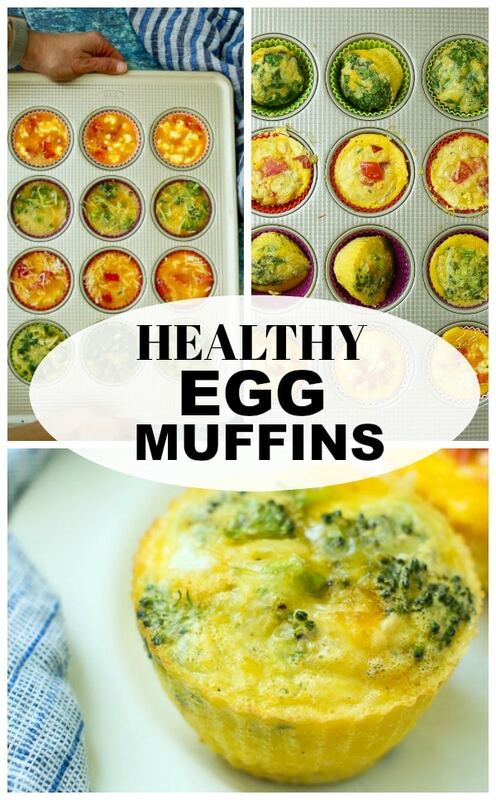 If you make this Healthy Egg Muffin recipe, or any Happy Healthy Mama recipe, I would LOVE to see it! Please take a pic and share it on Instagram or the Happy Healthy Mama Facebook page and tag me @happyhealthymama ? Previous Post: « Sun Basket Review-A Healthy Meal Kit Service! Yummy! That is sooo creative and delicious. I’m definitely gonna try this. These look like they would be a great on the go breakfast, can’t wait to try them. How would you recommend reheating them? I reheat them in the oven. 350 degrees for just a few minutes does the trick. A microwave would work as well! I’ve got several egg recipes on my blog, but I struggle with them getting watery with too many veggies. Do you find that?